Sharp cut filters, infrared transmitting filters, blue filters, green filters, light balancing filters, color compensating filters, neutral density filters, heat absorbing filters, UV transmitting/visible absorbing filters, and multiband calibration filters all make up HOYA’s color filter glass line. A wide range of coatings, thermal strengthening and custom size and thickness options (custom thickness as low as 0.5mm is available upon request) are all available for this line. Additionally, each filter can be outfitted with stringent tolerances and a surface finish. 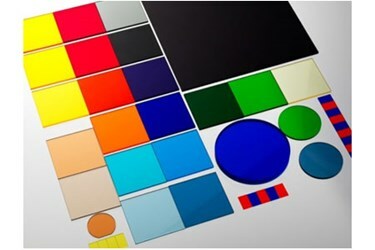 HOYA’s color filter glass encompasses a wide range of spectral characteristics, covering the UV to IR region. The highest possible purity chemical composition determines each filter’s transmission spectrum and precise control is used during the glass melting process. This ensures a high degree of consistency and quality. For more information on HOYA CORPORATION’s color filter glass, download the datasheet above. You can also contact them directly to discuss your custom requirements.